It’s that time of the year again when we introduce a new release of SOLIDWORKS Composer. We’ve had one full year to improve the product and this time around we had a lot of our multi-year projects come to fruition. The overall theme of this release was to deliver improvements on productivity, integrations with other SOLIDWORKS products and features while also balancing the need to build in the architecture for future improvements. As we do with all SOLIDWORKS products, everything that went into this release of SOLIDWORKS Composer was a direct result of our community of users who have always been proactive in giving us their best feedback. 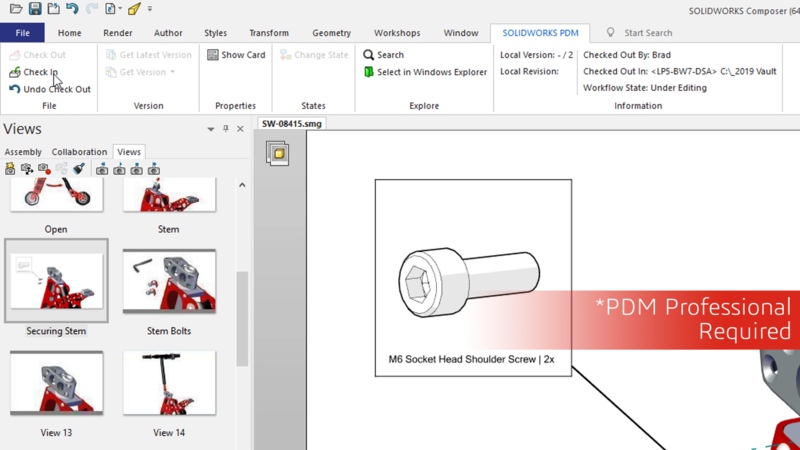 The first thing you’ll notice in SOLIDWORKS Composer 2019 is an updated User Interface. We’ve updated and modernized the look and feel of SOLIDWORKS Composer this release. This is the first step in a multi-year project where we are looking at providing our SOLIDWORKS Composer users with the ability to have modern-looking icons, give them the ease of access for their favorite commands, and in the end be more efficient with their time in SOLIDWORKS Composer. We’ve also added the command search bar in the ribbon to make the experience of searching for a feature similar to SOLIDWORKS and also added a Lock command on a view level to prevent accidental updates that could lead to needless rework. With the SOLIDWORKS Composer 2019 release, we can import Product Manufacturing Information (PMI) directly from the SOLIDWORKS CAD model into SOLIDWORKS Composer. 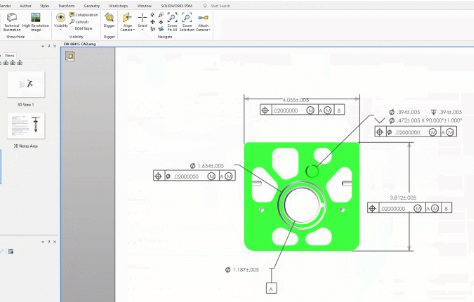 All the DimXpert dimensions, annotation views and 3D views carry right over, and you will no longer have to be recreate these in SOLIDWORKS Composer. This means manufacturing intent is preserved directly in the source SOLIDWORKS CAD model where it belongs. SOLIDWORKS Composer 2019 for the first time will offer a basic integration with SOLIDWORKS PDM for our SOLIDWORKS PDM Professional users. This new feature will make it extremely easy for you to be able to do basic PDM tasks like check in, check out, get latest revision, etc., directly from SOLIDWORKS Composer via the Ribbon bar menu. We will be looking to enhance and improve this integration over time and are actively taking feedback on what they would like to see in this integration next. This was just a sample of the top three from the what’s new in SOLIDWORKS Composer. SOLIDWORKS Composer 2019 allows you to be more productive and integrates better than ever before with other SOLIDWORKS products. For more information on what’s new in SOLIDWORKS Composer and how you can leverage SOLIDWORKS Composer in your company, please contact your SOLIDWORKS Reseller today!